Sipping an expensive coffee in Broadway Market, it’s impossible to believe that a neo-Georgian block of flats a short walk away, with high ceilings and sash windows facing out onto the canal, was once on Hackney Council’s ‘hard to let’ list. But back in the late 1990s the Haggerston Estate had a really nasty reputation. It was ‘the heroin capital of Europe’ in contemporary press reports. Delivery men refused to enter and social tenants were desperate to live almost anywhere else. The buildings had fallen into disrepair and the plan was to demolish the estate before the turn of the millennium. None of which deterred German film-maker and university tutor Andrea Luka Zimmerman from making Samuel House on the estate her home for the next 17 years. Samuel House was the gigantic brown-brick building that used to stand on the bank of the Regents Canal a couple of bridges down from Broadway, its windows filled with person-sized portraits of the remaining residents. It is now, finally, rubble, shut away behind a high fence. The date for demolition was announced seven years ago. Zimmerman’s film is about the changes in perception its subjects experienced once they knew their estate was going to be knocked down. It registers what Zimmerman calls “the thickening of the moment when you know you are going to lose something. Zimmerman describes smashed windows, pealing wallpaper and leaky ceilings, but says the building was otherwise a pleasant place to live. “It wasn’t different from anywhere I’d lived before really. The neighbours were always very nice.” The main cause of problems, she says, was a lack of maintenance. She’s sympathetic towards these failings, pointing out there were restrictions on how much councils could borrow to fund social housing – restrictions which are in large part still in place. “It wasn’t like Hackney Council didn’t want to do repairs, they just couldn’t afford it,” she says. However, she still feels it’s wasteful that a good building was allowed to go fall into disrepair. The Haggerston Estate was built in the ‘neo-Georgian flatted dwellings’ style, designed to resemble Georgian terraces. (That’s one reason why all the buildings and streets on the estate are named after characters from Samuel Richardson’s 18th century novel Clarissa). In the 1930s, hundreds of these structures were built around the country from a mass-produced blueprint, with individual variations in different areas. “Each individual council sort of made up their own version. It made it very democratic; it could be done by anyone,” says Zimmerman. They were also built to last, and for all that physical decay was a blight on the estate, Zimmerman believes there were deeper forces at work which ultimately led to the buildings’ demolition, making a comparison with “real Georgian buildings” which are over twice the estate’s age but have been lovingly maintained throughout subsequent generations. Social structures are as much a concern in Estate: a Reverie as architectural structures. “I’m really interested why it is that in buildings that are made to last – what is it structurally that destroys the community – in Hackney, in Islington, in Camden, Harringey? Zimmerman first conceived of the project when in the early 2000s a private security firm was installed on the estate without the residents being consulted, with two rottweilers kept in one of the flats. It was a move which, in Zimmerman’s view, made everybody feel less safe. 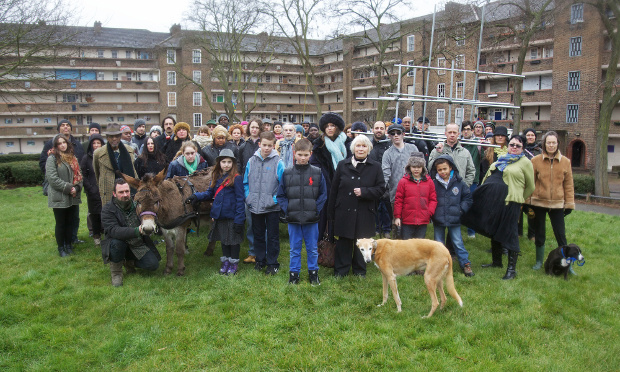 An opportunity for the residents to take control of their own image arose in 2007 when the estate was taken over by the London and Quadrant Housing Association (L&Q ). L&Q wanted to take down the orange boards over the windows and that made way for the project I Am Here, the gigantic portraits of residents which used to look out over the canal. These portraits are now kept in a container, ready to be returned to their subjects as and when they ask for them. Estate: a Reverie documents this period, with interviews with residents and footage of the way the community developed as it gained control over its environment, including historical re-enactments of living conditions experienced by the estate’s first residents before they were moved there 80 years ago. Just across the canal from the ruins of Samuel House is Bridge Academy, a very successful instance of providing a state-funded institution with autonomy and decision-making power. She likes the new accommodation she has been given in compensation for the loss of her flat in Samuel House, but was no fan of the security system originally proposed, in which residents would need to use their door fob to operate the lift doors, which would only open when the lift was at their own floor: the building was designed with the assumption that residents wouldn’t know other people in the block and would never visit them. The residents managed to resist the imposition of this feature. There’s a bigger story to social housing in Britain, but Estate: a Reverie is a powerful voice for the residents at the centre of that story. It documents what can happen when people decide to trust each other, and goes a good way to disarming mutual suspicion, one of the biggest threats to anything prefixed with ‘social’. Really would like to catch this film, any other dates? The use of signage without consultation by Hackney housing to stamp their ownership on our homes (& power over residents) really rings true. They recently put up 8 no smoking signs in a communal passage way that serves 4 flats ostensibly in order to stop a 70 year old Vietnamese guy smoking on a communal balcony with no roof. ..i wasn’t happy about his smoking, but I much preferred it to their nasty little officious signs. I enjoyed reading this article even though I missed the screening. I am 63 now but I was brought up from the age of 6 weeks at 40 Richardson House (long since demolished), and then at 9 Samuel House. It was a tough area and we used to play out in the London smog in the late 50s early 60s. I did visit a few times and saw a lot of ghosts from my past. I am a teacher from the Haggerston area trying to track down those who have experienced the changes in the local area, would it be ok if I contacted you directly? My A Level Geography students would greatly apricate it!